Cross stitching is a precise craft – after all, to achieve the quaint, quirky and creative patterns we see splashed across our Pinterest boards and Tumblr dashes there has to be a degree of care and meticulous attention to detail. And apart from all the bits and bobs you’re going to be having in your kit, from hoops to needles, there’s one accessory not automatically included in a cross stitch kit – a good light source, not only to help you avoid mistakes, but also to keep the strain off your eyes as you work away on your projects. Task lights are always handy for any activity demanding precision, but cross stitch enthusiasts recommend lamps of daylight color temperatures (at or above 5,000 degrees Kelvin) – artists and designers alike prefer this color temperature, since it closely resembles natural daylight and gives you an accurate idea of how colors and patterns will show up on your work. We’ve dug around in search of the best lamp for cross stitching – from tabletop varieties to floor lamps, here are our top picks. 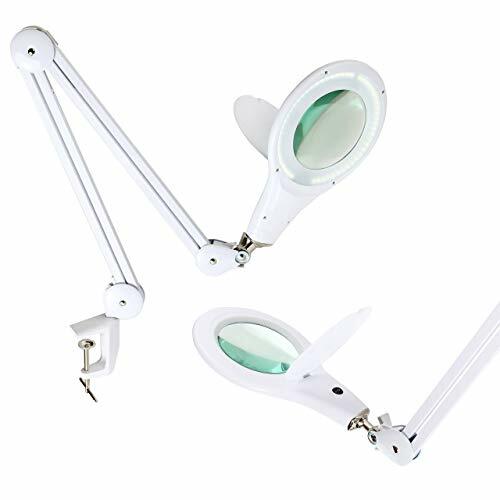 This is in many ways a two-in-one cross stitching essential – not only is this a heavy-duty, versatile daylight lamp, but is also a magnifier, an essential must-have for cross stitch enthusiasts. With a large 5-inch diameter lens of magnification level 2.25X to make counting stitches and working through intricate embroidery that much easier and more accurate, 56 energy-saving LED bulbs built around the lens also give you a bright and focused 650 lumens daylight glow to make every stitch of your embroidery stand starkly out. 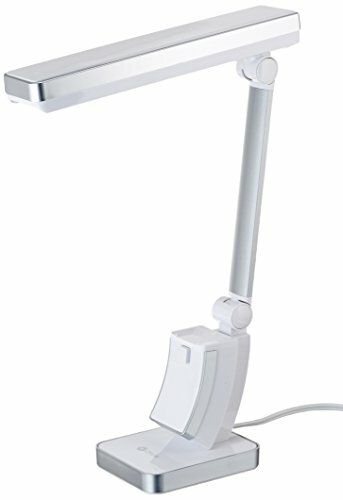 A great option to include for a craft or sewing table, especially if you’re working on big cross stitch projects, the lamp comes with a triple-jointed 38-inch arm in-built with a 360-degree swivel cantilever, making this a highly flexible lamp to clamp on to the edge of your workstation. Not only does this save work space, the flexible arm is also easy to move out of the way and reposition when and where you need it, be it to get a closer look at the stitch count or to throw your patterns into sharp relief to catch or prevent mistakes, as well as giving you plenty of reach over an entire work bench. The heavy-duty aluminum clamp opens to 2.5 inches and securely holds the lamp in place. With just a 9-watt power requirement, the lamp won’t overheat and leave you steaming and uncomfortable as you work, and comes with a concealable 60-inch power cord. Looking for a budget option, or a simple but reliable desk lamp for a craft table? Versatile and attractive with its no-fuss contemporary design, the lamp is programmed with four types of mood lighting – cool white lights for reading, art, design and of course activities like cross stitching, as well as softer and warmer yellow lights to help you relax and doze off. 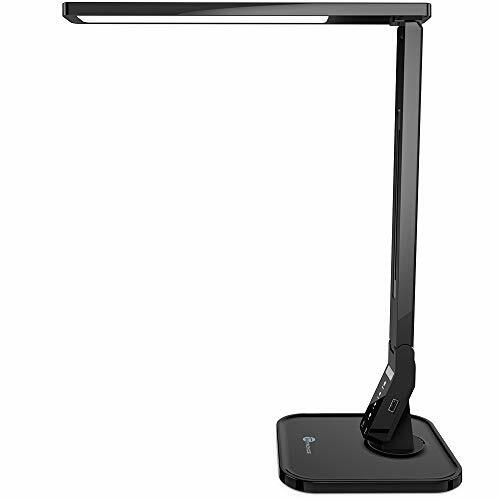 Five adjustable degrees of brightness and the 140-degree rotatability of the lamp arm give you even more flexibility, choosing the light angle and intensity you need, the 180-degree swivel base of the lamp also letting you illuminate the area you need without any glares or ghosting. This helps keep the strain off your eyes as well as catch and avoid mistakes in your embroidery. Touch sensitive controls make operation a breeze, a foldable design making the unit simple and convenient to store away or pack up to carry with you, while a USB port lets you charge your handheld devices when you need to. The LED lamp uses 75% less energy compared to incandescent bulbs, its slim and compact design perfect for diverse uses not just for hobbyists but also as a reading, mood or bedside lamp. Touch sensitive controls make operation a breeze, a foldable design making the unit simple and convenient to store away or pack up to carry with you, while a USB port lets you charge your handheld devices when you need to. 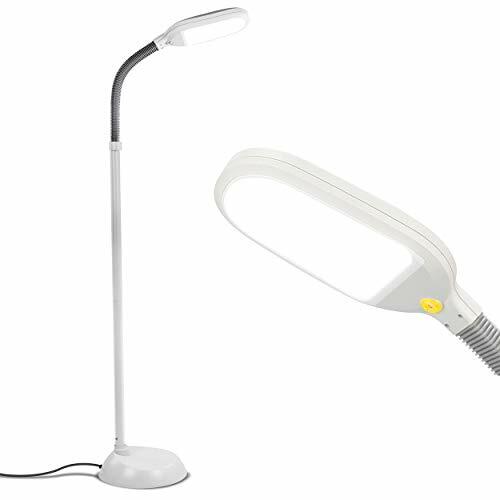 The LED lamp uses 75% less energy compared to incandescent bulbs, its slim and compact design perfect for diverse uses not just for hobbyists but also as a reading, mood or bedside lamp. Some of us like to cross stitch as a therapeutic activity, and sitting at-table with hoop, needles and thread might not give us much room to relax and soothe the mind. With a floor lamp, though, any armchair or couch can become our cross stitching corner – especially if it’s this floor lamp. The non-overheating LED lamp gives you an output of 2,000 Lumens brightness and a maximum color temperature of 6,000K, the cool white light perfect for making every last detail of your embroidery stand out true to color and keeping the pressure off your eyes, so you can work round the clock and at any hour of the day snuggled back with some pillows and the TV on. With far more longevity than quick-to-burn out incandescent or CFL bulbs, this energy saving lamp is robust in other ways too, with a high-stability base ensuring there’s no likelihood of it tipping over. Available in 5 color options and with a minimalistic, contemporary design sure to flatter all types of spaces, the lamp is also versatile in use, with a flexible gooseneck allowing you to adjust the angle of the light for better control over what you’re illuminating and where, as well as dimmable brightness options to let you settle on the degree of lighting you need, anywhere from stark cool daylight to a softer, mellow orange glow for mood or ambient lighting. An in-built memory function recalls the brightness level you were using when the lamp is switched off and reverts to that degree the next time it’s switched on. Sleek, low-profile but classy, the slim foldable lamp is as attractive a table-top option to complement your décor and tie your workspace together as it is a brilliant – pun intended – tool to help you make the best of your cross stitching activities. The rotating shade and articulating shaft allow you to position the lamp and angle light where you need it, the energy-saving OttLite bulb designed to last you much longer than typical incandescent or CFL lightbulbs, as well as to shine away without overheating. The bright, anti-glare daylight glow of the lamp perfectly illuminates color and detailing easy to miss or mistake in normal interior lighting, making it a great addition to a craft table not just for cross stitching but for any craft involving a reliance on color and careful detailing, including painting, drawing, sewing, quilting and so on. The foldable design makes this both a space-saving lamp as well as a great option for easily storing away and carrying.